Basic Kanji 320 (for N5 and N4) This is not free. You are able to study NECESSARY KANJI(and combinations of Kanji) ONLY for the Levels in a short period. You can confirm your achievement with the attached quizzes. Review is important for the study of Kanji. Review quizzes are included. Corresponding to Japanese Language Proficiency Test N5. If you study 20 Kanji characters per week, you will cover 120 kanji in 6 weeks. Corresponding to Japanese Language Proficiency Test N4. If you study 20 Kanji characters per week, you will cover 320 kanji in 16 weeks. If you study 40 Kanji characters per week, you will cover 320 kanji in 8 weeks. Watashitachi ga tsukurimashita. We have full confidence with the contents!!! 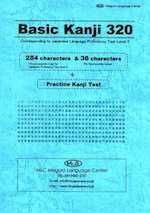 Basic Kanji 320 was an excellent book for quick preparation and reference as well. Solely by concentrating on this, I could get good score in my Kanji part of N4. Thanks for all the hard work you have put in preparing. Sudhakar J. - PayPal (Credit card) : Even if you don't have a PayPal account, you can pay with a credit card through PayPal. 1. Please fill in and submit the order form below. 2. We will e-mail you our bank account/PayPal account. Even if you don't have a PayPal account, PayPal accepts all major credit cards. 3. Please transfer the fee into a bank, or PayPal account. 4. We will dispatch your order. You will receive that in a few days. Cash-on-delivery is not available. 2. We will send you an invoice by PayPal. Even if you don't have a PayPal account, PayPal accepts all major credit cards. 3. Please settle the payment by PayPal. 4. We will send the PDF files by e-mail in a few days.